The four-week campaign for the May 6 parliamentary elections will be over in a few hours. It has been judged as unprecedented for its calm demeanor, and was more tolerant in terms of both the parties’ attitude towards each other and the coverage of their activities. Saturday is a ‘Day of Silence’. 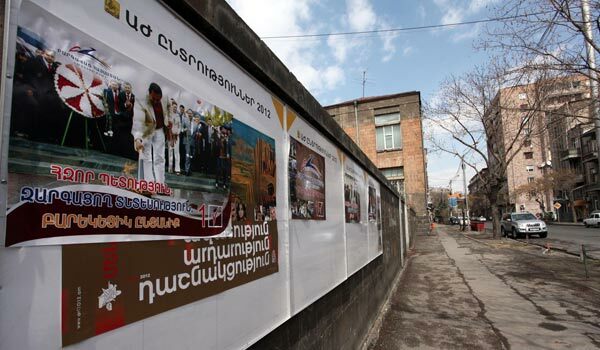 Prior to that, the ruling Republican Party of Armenia (RPA) will conclude the campaign Friday with large-scale events simultaneously in Republic Square in Yerevan and in Armenia's second largest city of Gyumri with the participation of pop singers. On Thursday, the main opposition bloc, Armenian National Congress (ANC), held its final rally, where it was reported that during the campaign the ANC visited all provinces of Armenia, organizing about 40 rallies. Just before the ANC’s rally the Prosperous Armenia Party (PAP) also held its final – and well-attended – rally, however it was cut short by heavy rain in Yerevan. “Go to the elections and do not listen to anyone! Vote for those whom your heart chooses,” said PAP leader Gagik Tsarukyan, asking people to leave not to get wet. Sociologist Aharon Adibekyan, head of the Sociometer sociological center, summing up the process of the campaign, stated that the campaigns of the RPA, which has kept its electorate, PAP, which has increased its electorate, as well as the Orinats Yerkir Party (Rule of Law), the Heritage Party and the Armenian Revolutionary Federation (ARF, Dashnaktsutyun) have been successful. As for the work of Armenian TV channels during the campaign, professional researches and responses received from the political parties show that TV channels have – for the first time in Armenian politics -- mainly equally covered parties’ and candidates’ activities.